﻿ How to fix Windows error code 0xc0000005? This tutorial includes step-by-step solutions to error code 0xc0000005 in three cases i.e. Access Violation error, application was unable to start correctly and MS office error. 0xc0000005 is a very broad and frequently occurred error code and there is no need to pay a PC repair guy when you encounter it. You can follow steps in this page to solve it quickly and easily and save hundreds of dollars. An application error has occurred and an application error log is being generated. Exception: access violation (0xC0000005), Address "The application failed to initialize properly (0xC0000005). Click OK to terminate the application"
Operating system is multi-tasking and complicated to provide better user experience. System has to distribute memory to fulfill tasks, making different processes have allocated memory and preventing virus. When a program attempts to access memory which has been distributed to another process and is not available for this one, you'll receive the error and the software will be terminated. 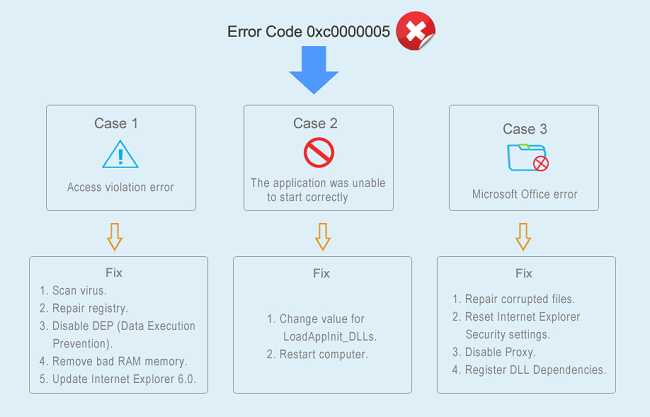 Causes of the error can be various, some common reasons behind this error are: registry issue, faulty RAM, DEP function, corrupted drivers, virus infection, incorrect system security update, etc. In many cases, it's difficult to tell the actual cause and you may need to try different solutions to get rid of the error. Not long ago, Symantec Antivirus software was a well-known cause to 0xC0000005, which can be fixed by simply updating the software. Besides, this error code can be outcome of using some third-party applications, and you should check their website or technical support to see whether this problem is noticed. Causes are somewhat complex, but solutions seem simple. The following section gives several common ways of fixing the issue. It's hard to clearly define the error on account that there are so many causes and different circumstances, thus its solutions are equally many. You may have to try many of these solutions before you find the one working for you. If your computer infects malware or virus, 0xC0000005 error is reported to prevent executions performed by malicious programs. Virus or malware infection is one of the most frequent common and starting a virus scan should be the first attempt. If there is malware or virus on your PC, the error code you get is a signal of it. The correct and first response to that is running a full virus scan for computer system and personal data as soon as possible. If you already have installed antivirus software, then update it to the latest version and carry out virus scanning. In some situations, the error code is caused by poor system maintenance and corrupted registry entries. Registry corruption appears due to software installation or uninstallation, for example users install new applications over old ones without deleting or uninstall them properly. System registry is usually deemed as SPOF (single point of failure) by many Windows users, which indicates that operating system is tied to registry and registry corruption may lead to system abnormal functions. In order to eliminate the error, you have to check registry entries and delete all redundant and invalid entries, but that'll be a complex process to many users who are not computer experts. One improper operation may turn computer into inoperable, such as deletion of wrong entry by accident. If you are not a computer guru, you can try some third-party software which is able to scan and repair corrupted registry automatically instead of repairing registry manually. Quite a few such programs are available on the Internet, and most of them work equally well. Data execution prevention was initially introduced by Microsoft and used on Windows XP Service Pack 2 and later versions. It is a set of security features designed for preventing code execution from non-executable memory segments. It checks memory in order to protect computer against virus. 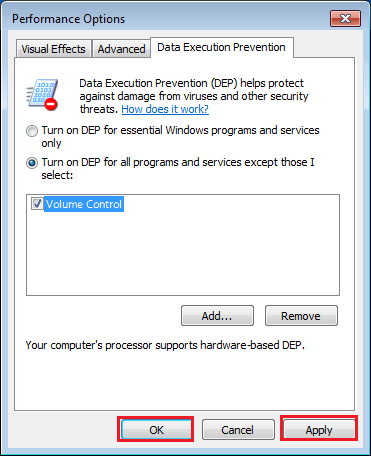 DEP has been enabled for both hardware and software components since Windows XP SP2. However, some programs are still unable to be fully compatible with it. Some applications adopt a technique, usually called dynamic code generation, which doesn't tag these codes with an execute permission. As a result, this conflict gives rise to the problem. Besides, if software is developed without SafeSEH, it tends to cause 0xC0000005 error when DEP is enabled on the computer. Log in computer with Administrator account to make sure you have fully administrative rights. If your computer is running Windows XP, click "Start" button and select "Run". Windows 7 user can press Windows and R keys. Type sysdm.cpl in Run box and click OK.
You can see System Prosperities window from which you need to click Advanced tab and then Settings. The "Performance Options" window will pop up and please click "Data Execution Protection" tab. Select the option "Turn on DEP for all programs and services except those I select" and click "Add" button. Browse files from the Open applet and find the exe files of the software which causes the error code. Select it and click "Open" button. Click "Apply" and "OK" to make changes take effect. A lot of times, a bad or incompatible RAM (Random Access Memory) brings about the issue. For instance, you've just added a new memory to your computer aiming to improve performance; however, you start to receive error code 0xC0000005 since then. You can get rid of the problem by simply removing the memory and restarting computer to check whether the error has disappeared. If that works, get a refund of the memory or replace it with one that is fully compatible with your computer. Before taking away RAM memory, you should turn off computer and remove all cables such as power, network, etc. If your PC is laptop, remove battery after shutting down computer. The error code may appear in Microsoft Internet Explorer 6.0 when you attempt to access an HTML file or web page. Meanwhile, the IE appears to stop responding when the error occurs. This problem appears especially when the HTML document or web page Internet Explorer 6.0 tries to open includes SPAN tags which were incorrectly closed. If the SPAN tag is not closed correctly with tag, the access violation will happen. With regard to solutions, Internet Explorer is outdated and current Windows 10 introduces Edge. You can install the later version of Internet Explorer such as Explorer 10 or use other free browsers such as Google Chrome, Mozilla Firefox, etc. You might go crazy because of the error message, as it may happen to any software installed on your PC such as iTunes, Windows media player, Google Chrome, VLC, MAX Payne, etc. In many cases, the reinstallation of the application can't fix the error. This error implies that the program can't be started, which can't be repaired by system reboot either. This problem arises because the DLL which supports running the software is not complete, not signed or becomes invalid already. Press Windows key and R key together to open Run command. Type "Regedit" in search box and press Enter key, and Registry Editor pops up. Double click LoadAppInit_DLLs and modify its value to 0 from 1 and click OK to confirm the changing. Restart computer and rerun the application reporting the error and it'll be able to start normally without errors. When you try to install Microsoft Office but the installation fails to complete, you'll get an error message with error code 0xc0000005. Many reasons can result in the problem, for example, system file corruption, previous installation files are not removed clearly, etc. The installation of MS Office might be blocked by security software or antivirus software installed on your computer. Proxy settings or Internet connection prevents Office from being installed. The error is caused by the previous Office suit on computer, such as previous files are not deleted properly, failed repair, incomplete, etc. The error code will be fixed when corrupted system files are repaired and the installation will be completed smoothly. Click Start button and select Control Panel. Next click Programs and select Programs and Features. Locate the Office program in the software list, select it and click "Change". NOTE: If you have bought a suite such as Microsoft Office 365, searching for the name suite. If you purchased an individual Office application such as Excel, search for the name of the application. Choose "Quick Repair" and click "Repair". If "Quick Repair" doesn't work, then try "Online Repair". Click Start button and type "inetcpl.cpl" in search box and press Enter key. Now you get the "Internet Properties" windows on which there is a "Security" tab. Click it. Click "Reset all zones to default level" button and click OK.
Open Command Prompt. Press windows kay and R key together and type cmd in Run box and press Enter. Type command netsh winhttp import proxy source=ie in Command Prompt and press Enter. If you get the message "Error writing proxy settings. 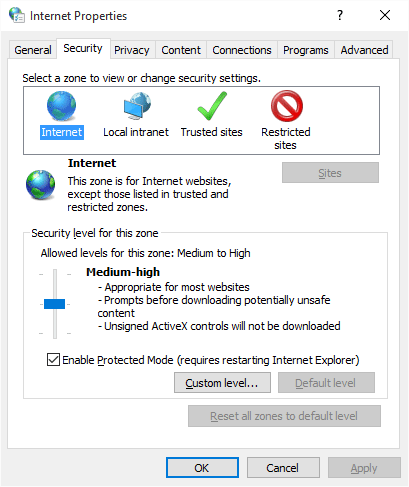 (5) Access is denied", that means you should disable Proxy setting in Internet Explorer. Start Internet Explorer by double clicking its shortcut icon from desktop. Click Tools button and Internet Options. Click Connections tab and select "LAN settings". Next choose "Use a proxy server for your LAN". Type the address of the proxy server in the Address box and type port number in Port box. If your network demands separated address for different services, for example, HTTP, FTP, etc. then click Advanced button to enter required addresses. Occasionally, the DLL (Dynamic Link Library) may get lost or not registered normally in system during Windows update or MS Office installation. For this reason, MS Office suit fails to install or start. 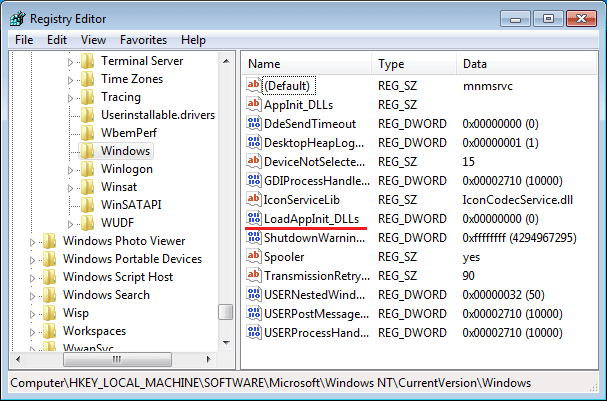 To register the lost DLL you need to open Run again by press Windows and R key. Type regsvr32 Officevalidator.dll and click "OK". "vacant of 0xc0000005 error application"
"i canot install and run any thing becus of this erour 0xc0000005"
"After i followed the registry editor procedure, it says window cannot be opened, Access denied......what can be the problem "
"My PC has failed to fix this problem of oxc0000005"
"when it found DLLS the window unfortunately disappear. What do i do"
"i was going through the procedures on clearing error 0xc0000005 but when i got to windows, i clicked but what i got is "windows canot be oppened. an error is preventing this key from opening. Details: Access is Denied." please help me out."